When I think about people in Champagne who have impressed me most during my numerous trips, among the firsts to pop into mind is a beautiful, wise, adorable woman in Reims. Her name is Aline Serva, and she owns a little bubbly heaven in the heart of the city with her husband Eric. 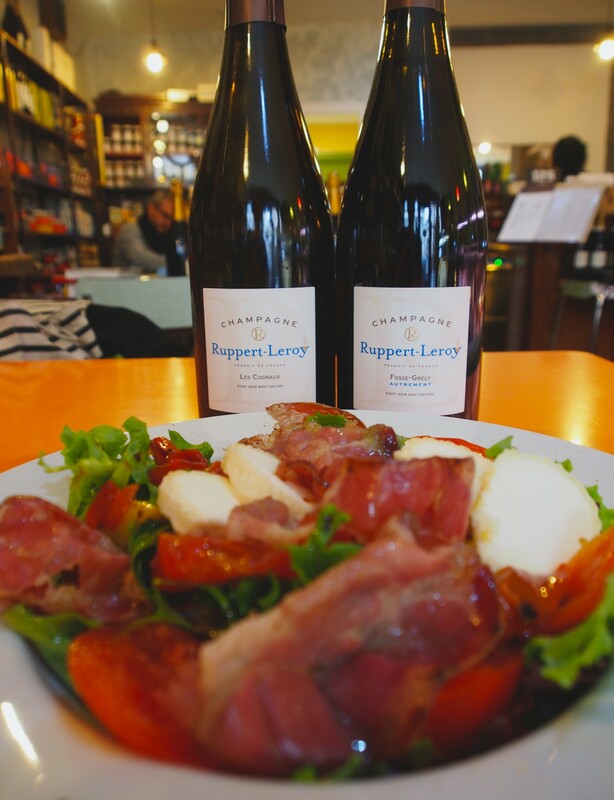 If you are into excellent charcuteries, cheeses and salads while sipping awesome grower champagnes, don’t hesitate twice! There is a risk you will fall in love. 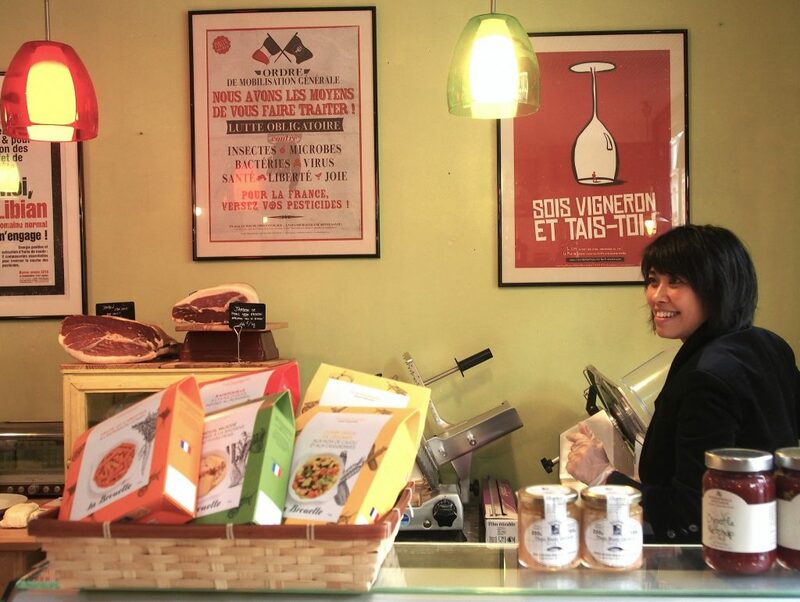 Everybody who has been to Epicerie Au Bon Manger knows Aline’s laughter. A ravishing, sincere laughter that comes deep from the heart, from a place where goodwill and joie de vivre embrace. No wonder after those long days of visiting winemakers, I always feel so cozy when opening this familiar blue door and hearing that famous laughter. 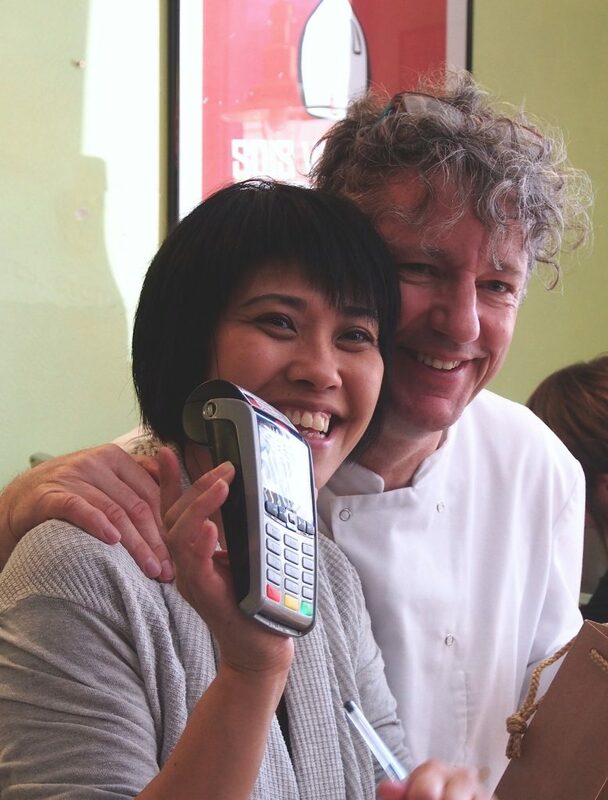 Coming from Paris, Aline and her charming husband Eric – whom I have more than once mistaken for another smiling curlyhead, champagne maker David Léclapart (and I’m not the only one!) – had completely different professions before establishing their gastronomic business: Aline worked for a Japanese fashion designer while Eric was making radio shows for the national radio (France Musique). 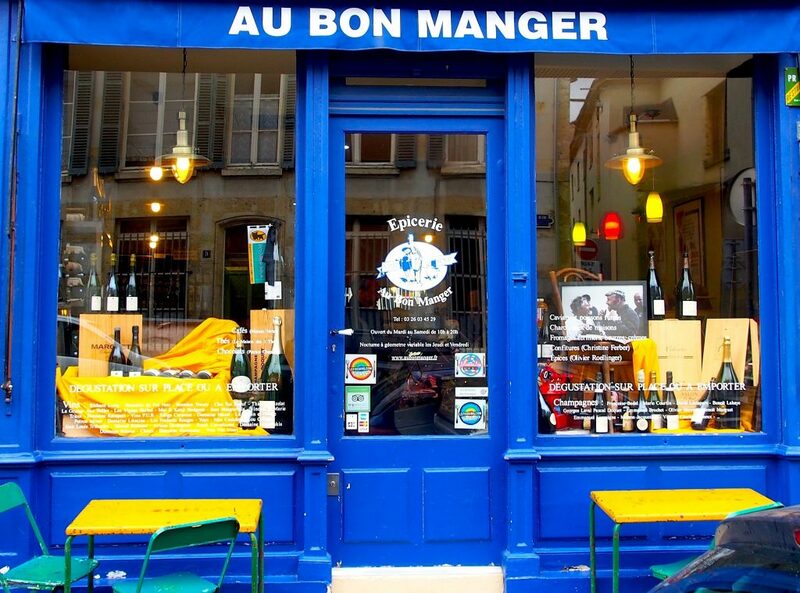 To the delight of all grower champagne fans, eight years ago Epicerie Au Bon Manger saw the daylight. It definitely is the best place in Reims to sample grower champagne. The selection is carefully thought out, and you always find something exciting on the shelves. In fact: SO exciting that you just lose the concept of time. That happens every time! Despite my earnest decisions, so far I haven’t managed to visit Aline & Eric without having to run for the train in a frenzy, dragging a heavy bag full of bottles. But let’s not talk only about bubbles as Epicerie without eating is an inconceivable thought. Everything they sell is of first-class ingredients. Charcuteries and patés are top-notch, salads are big and tasty, and if you don’t have time to stay, they will wrap a nice baguette for your Paris-bound train. From their well-equipped counter and shelves you also find nice things to take home. Even if you are short in time, I recommend you to pay a visit to Epicerie. 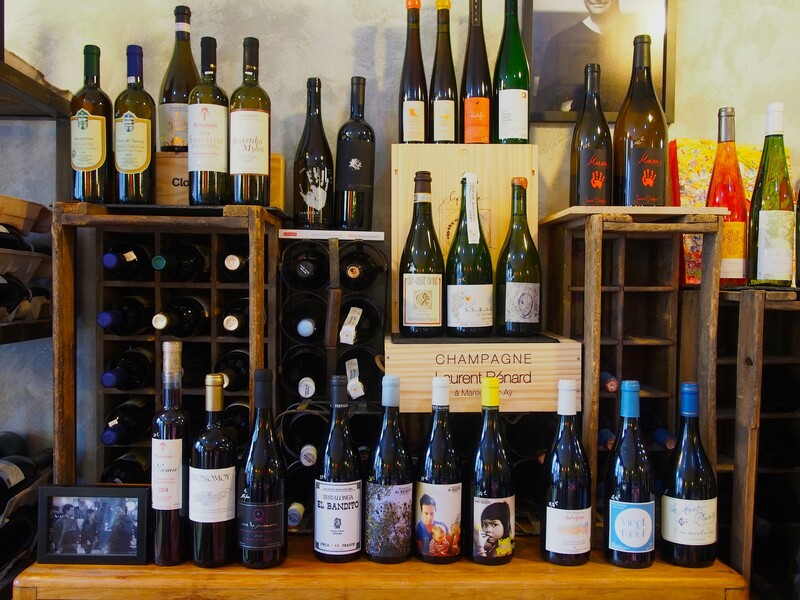 Only 10 minutes walking distance from Reims train station, it’s a must for any bubblephile and natural wine lover. Favoured also by local winemakers, with good luck you may catch a glimpse of your favourite vignerons – or even end up spending the evening with them (like I did with Jérôme Prévost and his family last April). And when it gets crowded like it does, in Epicerie you never feel stupid just standing in the middle of the small space with a glass of bubbles made with love in hand. The atmosphere is so cozy that it is not odd at all to end up there both for lunch and dinner. During the Champagne Week in April the place is buzzling with people, and it’s great to mingle with champagne lovers from all around the world, make new friends and cin-cin for life together. But I must admit I love even more those peaceful morning moments, when Aline, Eric and Audrey are just about to open the doors as the new day is shining to this nicely decorated epicurean heaven. 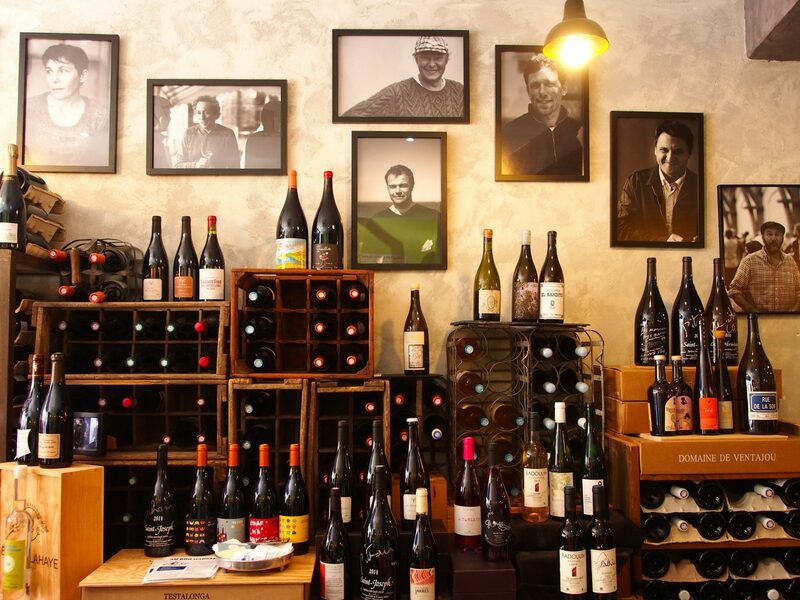 Nowadays the walls are decorated with beautiful photos of vigneron characters such as Vincent Laval, Olivier Horiot, Dominique Moreau and Emmanuel Brochet. The man behind these portraits is a superb Danish photographer & champagne connoisseur Thomas whose blog is a must-read for all grower champagne fans. My last visit at Epicerie was way too short, but also one of the most memorable ones ever. Coming from Troyes by carpool system, I managed to arrive early enough to have a chat with Aline – and a little birthday lunch before heading to Avize. She seated me at the table with a stylish French gentleman, and we enjoyed a nice lunch together. As he heard it’s my birthday, he insisted on buying me as a present those two bottles of Brochet’s Le Mont Benoît I had reserved. What an amazingly sweet gesture from a stranger! My birthday lunch on October 20th. …so if I can explore it for the rest of my life, I will die a happy woman. 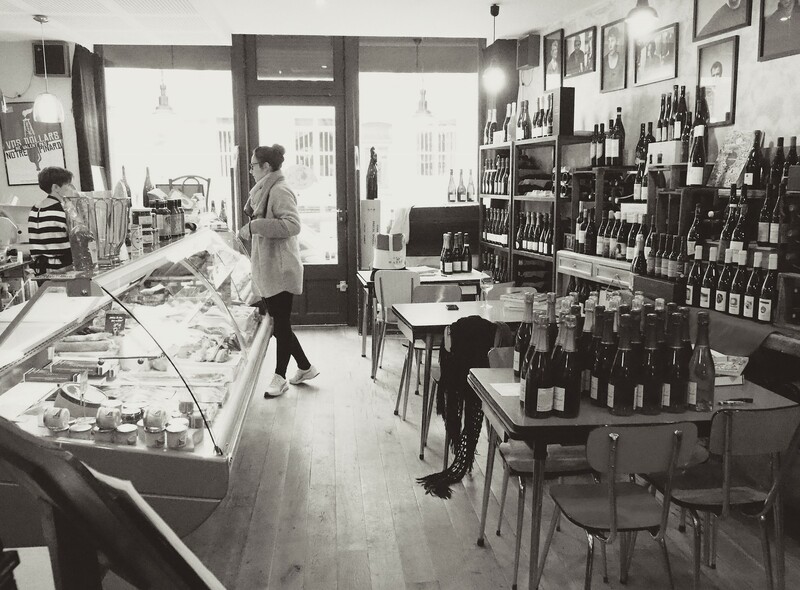 Meanwhile, I hope there are still many evenings to come at Epicerie Au Bon Manger. In these times of Donald Trump in power, this world needs more Alines. 7 Rue Courmeaux, Reims. Tue-Sat 10–20 (or longer to varying degrees). Tel: +33 (0)3 260 345 29. Alas, if I one day could visit this “tasty” place ! This looks like heaven!! I have only ever visited Reims with kids but if I get to visit without them one day, this is at the top of my list! Oh Daisy, it is, you definitely have to go next time! And yes, many times I’ve seen kids there as well. Just make sure you go early enough as during lunchtime it gets crowded. The owners are among the loveliest people I have met. Oh so quaint!!! I am planning a trip to champagne this year and this little place will be bookmarked for sure! Great to hear you got inspired! They have just renovated the place a bit, so it is newly opened with a fresh face.